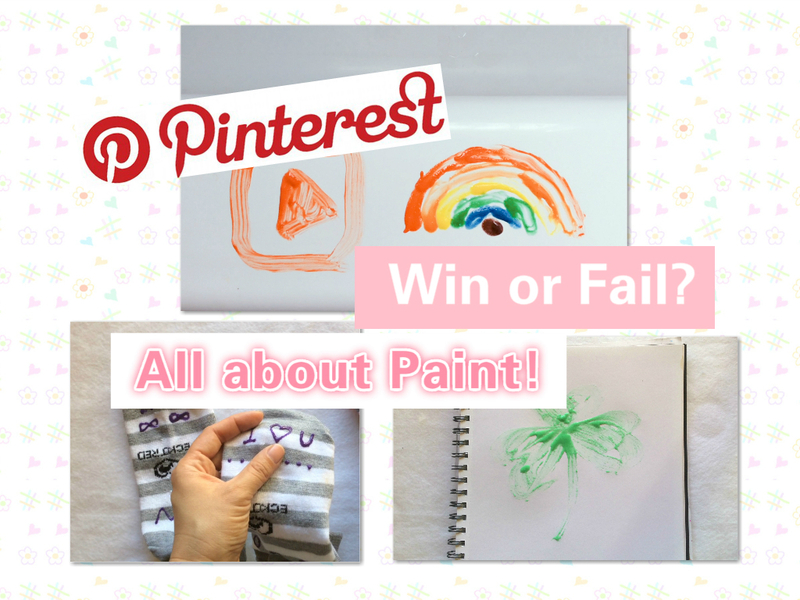 C is 4 Crafting: Pinterest: Win or Fail - All about Paint! A few year back, I found out that Internet is a great place to find DIY inspirations. I started saving images all from blog posts in my laptop which got pretty overwhelming pretty soon. Soooooo many images, so many ideas! When I needed to find something I needed to browse through the icons (tiny picture) of all the images I saved in different sub-folders. Until one day, I found PINTEREST!!!!!!!!!!!!!!!!!!!!!!!!!!!!!!!! Now I don't know how I can live without Pinterest. When I have a couple of minutes waiting for something or I can't fall asleep at night, I open my Pinterest app, check the new pins in the boards I am following, the DIY and craft board and the kids and parenting boards and I pin, pin and pin. Hey, Pinterest changed me into a PATIENT person. I don't mind waiting anymore. Collecting ideas through Pinterest becomes so easy. However, I find myself not trying anything I pinned. Today, I gathered three kids DIY from Pinterest I wanna try. They are all about paint. Win or Fail? Let's find out. First, DIY BATH PAINT with three ingredients you already have at home.--totally a WIN! original post is from Modernly Mogan in her DIY Bath Paint post. I used 1 cup of shampoo, 1 cup of cornstarch and maybe 1 tbsp of water. 1. scale it down to your needs. I have two girls and a big boy (my hubby) at home so I made a big batch. Second, DIY non-slip socks with PUFF PAINT--IT WORKS! original post is from I AM Momma-Hear Me Roar in her Handmade Gripper Socks post. 1. Choose easier pattern to draw. 2. If you have a different brand of puff paint, give it a try and let me know. I just couldn't write smoothly with the brand I used. This image pretty much says it all. I just couldn't use it to paint. I tried to dissolve the salt in water first. Too much salt for the water, even warm water can't take that much salt. I can't locate the original post. It seems to be from Reddit. When I googled "Never Buy Paint", all the images are the image I found in Pinterest which didn't help. Well, do you have a Pinterest account and collect ideas about DIY, kids stuff? I'd like to share link with you. Hope this post motivates you to try some pins.